The game starts at 7:05 p.m. and fans who have a game ticket for July 18 will have an opportunity to attend, but a separate ticket for the Rickey Henderson autograph signing will be required. According to the Oakland A’s website Rickey Henderson will participate in a separate ticketed autograph session in the Eastside Club at 5:30 p.m. Tickets for the session will go on sale at 4:30 p.m.
Rickey Henderson is a retired MLB left fielder who played for the Oakland Athletics from 1979–1984. Henderson is a two-time World Series champion for 1989 and 1993 plus he is a ten-time All-Star for 1980, 1982–1988, 1990 and 1991. Henderson is the Gold Glove Award winner for 1981 plus three-time Silver Slugger Award winner for 1981, 1985 and 1990. He was American League MVP for 1990 and the ALCS MVP for 1989. Henderson is twelve-time stolen base leader for 1980–1986, 1988–1991 and 1998. Henderson was inducted into the Baseball Hall of Fame in 2009 and his number 24 was retired by the Oakland Athletics in 2009. Sports Speakers 360 is a booking agent for pro athletes. 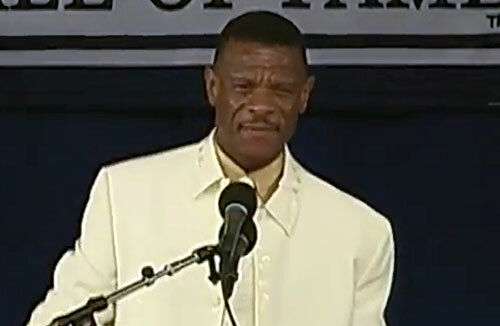 If you would like to book Rickey Henderson for a speaking engagement, appearance or endorsement, contact a Rickey Henderson booking agent for fees at 1.855.303.5450.